10:02 PM. 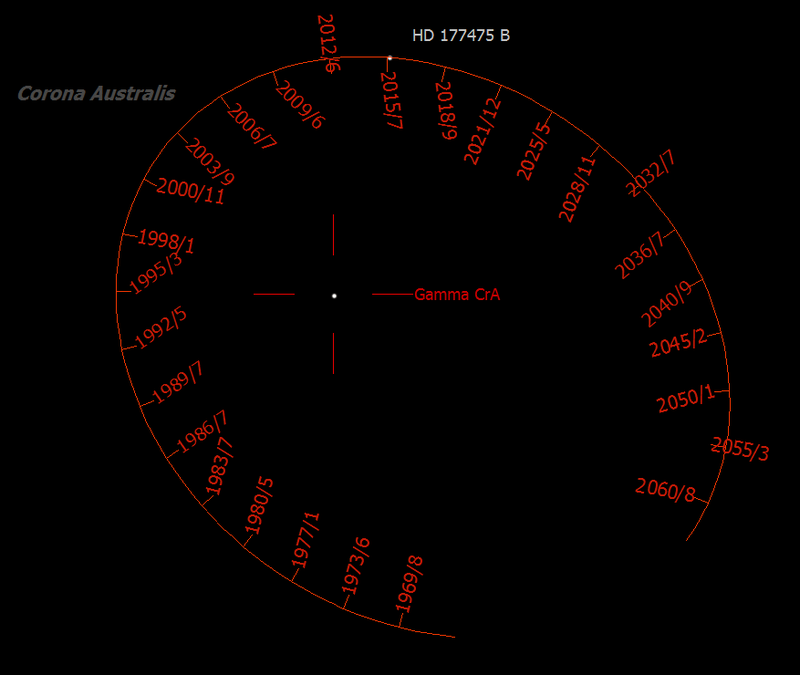 Decided to view the crazy double star from the Sky & Telescope summer list, γ (gamma) CrA. 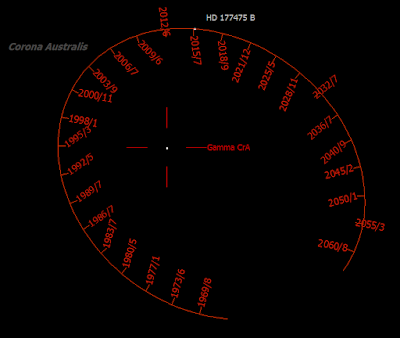 This was about the best time to view Corona Australis. 10:10. Had another go. Two stars. 1.4". A fast-mover. 122 years. Similar magnitudes, 4.2 and 5.1. Interesting, according to the software. But I simply could not split them. Soupy. Swimming. Crazy. In SkyTools, I simulated the view in the C14. Tried eyepieces. 18mm. 10mm made them a peanut. 5mm. 3mm made a black line between them. Crazy. On top of one another. Sadly, maybe I would never be able to split this pair from Ontario. Florida? Real time info: 6.7 airmasses. Ugh. Around 9° above the horizon. Kicked in some strict filters to limit the target objects to good ones... The Obvious option dropped the candidates number to 22. Windy. Gusting. Checked the local weather data: 10 minute average wind speed was 16.1 km/h, from the south-west, 16.1 immediate, high was 29. Humidity 81%. Barometer 1015.2. Temperature 23.3°C, dew point 19.8. Oh. ρ (rho) Cap. Wait. That would be better in one hour. Planned to remove the dew cap from the SCT. What about Campbell's Hydrogen Star? Near Albireo. Up high. Slewed. Reviewed the temp again: inside 25; outside 23. 10:27. I saw a double. Faint stars. AG 387. AG 387 was to the south of the centre of the field. I noted a large Christmas tree shape. The bright star to the north was HD 184907. ST3P said it was a pair but I could not see the companion. I noted what appeared a double to the east but ST3P did not show them as related. I was still over a field away from Campbell's. Noticed Minkowski's Footprint nearby. I could view it later. Planned the star hop from my current spot. Up. Straight up from the bright star. OK.
Ian W dropped by. Had a look. Offered to get his Pentax 10.5mm ocular. And his UHC filter. The Context Viewer showed it was a decent size. Also a good size in the 40D FOV... Hmmm. Ian was imaging. Or trying. He too was hoping the wind would die down. 10:43. I felt cool. Put my sweater on. I thought the view better in the Pentax. Ian liked it. We could see fainter stars. Wind 20.9, high 32, average 19.3. Had hoped it would die down. Humidity was 85%. Higher. Verified the dew heaters were on. About to hit the meridian. Tricky to find so I checked the pointing spot in TheSky 6. Very near a bunch of UCAC 2.0 stars. Lame. Tried to find one with a "good" name. I would have imaged it. The wind foiled that plan. 11:12. I was not enjoying the wind.